The Garmin Tri Series is held at the Sydney International Regatta Centre at Penrith with entry through gate ‘A’. Registration and transition are located on the grassed area just over the bridge to the island on which the grand stand is located. A map of the event course will be available at the Registration Tent and is available on the Hills Triathlon Club Facebook page. Upon entering the gates of the Regatta Centre, you must abide by the speed limit imposed by the Regatta Centre management. The Regatta Centre has ample parking on the island opposite the registration and transition area. It is important that you park only in marked parking areas and follow the direction of all Regatta Centre Rangers. If the car park on the island is full when you arrive, overflow parking is available on the Southern side of the competition lake. Officials will be on hand at Registration to answer any specific questions you may have concerning the course, the rules and to assist you generally. Do not hesitate to raise any query no matter how trivial it may seem. You are reminded of your acceptance of entry conditions, waiver release and indemnification. Please note this is a legal part of entering the race and affects your rights. You have attested your physical condition to participate in this event. If you have developed a medical condition since you registered to enter, then this should be brought to attention of the Race Director and, where deemed appropriate by the Race Director, a medical certificate produced. This will take place at the transition area. At Registration, you may be required to produce some form of I.D. (drivers licence, T.A. licence). Registration must be completed by the time specified. Only competitors will be permitted to enter the transition area. Note the Race Director will monitor and collect timing bands from competitors who may be transported from the course direct to the Medical Recovery Area at the Finish Compound. Qualified First Aid Personnel will be on duty at transition. Please ask for medical help if you have the slightest hint you may need it. Any aid given by race medical personnel on the course is permissible and will not lead to disqualification. If, however, you have any other outside assistance you will be disqualified. You will be withdrawn from the race only if you require transportation, IV fluids, or if medical personnel consider your continued participation presents a danger to the health or welfare of you or others. There will be a drink station on the run leg just after the exit from transition. Toilet blocks are located behind the eastern end of the grandstand approximately 100 metres from the transition area as well as in the boat shed behind the grandstand. Competitors will be allocated a race number. The bike number must be affixed to the seat post of the bike and the helmet number to the front of the helmet. The bib number must be worn during the run leg. Race belts will be available for purchase from the registration tent. You should ensure that your bike is in race worthy condition and you must wear a Bike Helmet that carries an Australian Standards Approved Sticker. You should ensure that it is adjusted properly. Enter the transition zone only after you have registered at the registration area and only enter by the entrance that will be manned by Technical Officials from Triathlon Australia. When entering transition your helmet should be on your head with the chin straps clipped together as if you were ready to race. A visual inspection of your helmet and bike will be carried out by the Technical Officials as you enter the transition zone. The transition area will close prior to race briefing. Bags must not be left in the transition area. A separate bag area is provided. Officials will remove any bags that are left in the transition area and put them in the bag area. Plastic bags are also to be removed as they can be a trip hazard during the race. Any special rules that may be applied by the Race Director will be notified to you at the Pre-race Briefing. The Race Director and Technical Official are in charge of race safety and logistics. The Race Director is responsible for providing a safe race course and has taken steps to make the race safe and enjoyable. Competitors are responsible for their own safety, the safety of their own equipment and are to be considerate of the safety of others. There are sufficient viewing areas on the course for your family, friends, coaches and supporters to see you during the race. Do not allow them to automatically disqualify you by being on the course with you. •DO make sure your competitor has read and knows the Rules and has thoroughly read this document. •DO NOT enter the water or swim in the lake at any time. You should place some form of identification on all your personal gear/property for ease of identification if any is misplaced and handed in to officials. Please note that the race organizers take no responsibility for lost property. Property handed into the officials will be available for collection until the transition area is dismantled and packed away at the registration tent. Unclaimed items will be discarded or delivered to charity. This is an issue with the event centre and we do not want complaints about the extent of discarded wrappers from the race. Please avoid discarding energy bar/gel wrappers and, where available, use garbage bins particularly on the run course. There is provision for disqualification for littering on the course. Your pre-race briefing will take place prior to the race start. Inherent in this briefing is an acknowledgment that you are familiar with Triathlon Australia Rules and the contents of this document. Any confusion or queries should be directed to the Race Director in the first instance before Race Day. Knowledge of the course and rules is entirely your responsibility. The race will commence by way of a staged start. 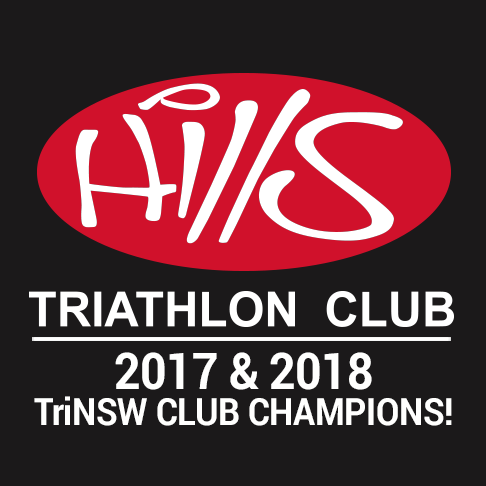 Start times will be emailed out 2 days prior to the event and will be posted on the Hills Triathlon Club Facebook page. Please listen carefully at the Race Briefing for the final determination of Wave Start Order. Parents are encouraged to help with the running of the junior events. A Dinky Derby for 6 years and under will be held after the main event and is subject to numbers and availability of parent volunteers. After crossing the Finish Line, please remove your timing chip and hand it to a race official at the finish chute. You will then move into a finish area where refreshments will be available for you. After the race, all competitors, supporters, volunteers and their families are invited to enjoy light refreshments at no additional cost. There will also be a draw of competitor numbers for prizes courtesy of our sponsors. Live results will be available on http://www.sportsplits.com and a direct link on http://www.hillstriclub.com/ when finalized after the event.